● Shoppers will come across many money-saving deals on the Queensboro home page. Most of these offers consist of BOGO deals and value bundles. ● New customers get special welcome offers such as 25% discounts and free gifts on their first orders. Returning customers can take advantage of special offers allowing them an added 25% off featured items. ● Queensboro also releases discount coupons and promo codes offering special discounts on featured brands or categories. Free shipping coupons are also offered from time to time. Embroidered apparel is important for any business that wants to create their own uniforms or promotional products as a part of a marketing plan. 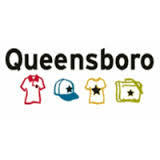 Queensboro is an embroidery company that also works with screen printing on different types of clothing. On the home page of their site you can take a look at their embroidered apparel, printed apparel, pens, mugs, and other customizable merchandise. If you're interested in selling products online you can also take advantage of their customization features for online stores. Customers can choose whether they want to work with the company to create a design or logo or they can use their design studio to create custom images. For most up to date offers check out Queensboro on Facebook and Twitter or contact Queensboro Support for any questions.